Professor White is close to cracking the notorious, unsolved Thomas Beale Cipher, purported to hide the location of a fortune in gold in this animation by site founder Andrew S Allen. Permit, if you will, an indulgence with this week’s featured short film pick. We take seriously the reputation this site has garnered for featuring the highest quality artistic and cinematic short films and animations—it’s the foundation of our audience. Short of the Week was created 4 years ago to fill a niche that at the time was more or less ignored online, however since then the idea of a curatorial culture has emerged to become one of the defining aspects of Web 2.0; so be it through Twitter, Tumblr, or Vimeo Channels, you now have a lot more avenues in which to be exposed to short films online. Quality must be our ethos therefore, the guiding theme for how we differentiate ourselves and keep you guys as fans. Recognizing that, we’re pretty serious about our selection process; exercising caution when it comes to the requests we get from filmmakers, agents, publicists and marketers. Sorry for this bout of solemnity, but because we take this—and you—seriously I feel the need to make that request for indulgence today. No objectivity will be found with this week’s pick. This time the film we want to share with you is our own. Site co-founder Andrew—startup guru by day, blogger by night—somehow fits filmmaking in sometime in the late-afternoon. The Thomas Beale Cipher is the highlighted film of the week, and it is his latest and most ambitious animation to date—one that I had the privilege of helping make a reality via a producer role. The film uses a unique style of rotoscoping to build a flat, graphic, world that that I have yet to see elsewhere. Based on a true legend of the most difficult cipher ever created, the 10 minute film centers on Professor White, cryptographer extraordinaire, who is on the trail of the notoriously uncrackable Thomas Beale cipher—a century-old riddle hiding the location of a fortune in gold that has tormented its pursuers since inception. But White is not alone—shadowy forces are tight on his tail. After a debut at the 2010 Seattle International Film Festival the film spent 8 months touring festivals all around the world. We have had fun seeing it with very enthusiastic audiences in Seattle, New York, Austin and Toronto, but now, rather than drag things out, we felt the hypocrisy had to stop. We are pretty big advocates of putting short films online after all, so the time has come to make it available for web audiences. This therefore is the online debut of The Thomas Beale Cipher, and the debut of a new series for the site, “Short of the Week Presents” where we feature films that have never been online before and help to coordinate their digital launch. If you have a film that’s looking for a large online audience, check out our submission process. 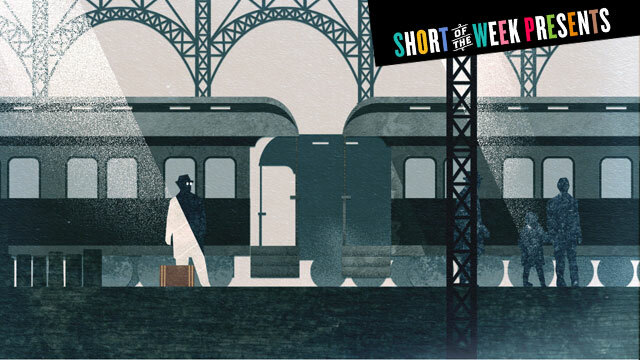 Short of the Week has never been conceived as a vehicle to promote our own projects, however we are proud of this effort and think it holds up reasonably well with the standards we’ve set. What say you? Is it worthy of our lovingly built web collection? Be the judge, we’d love to hear from you either here or on the film’s Vimeo Page. Andrew and I will of course try to be prompt with questions you might have regarding the film, be it the story, process, or design. Thank you. Your regularly scheduled short film content will start again Wednesday with a pretty great Short of the Moment.